The Mercer and Somerset Railroad has many notable distinctions, not the least of which is that it was the first railroad in New Jersey to go bust when it folded operations in 1880, just less than six years after making its first run. If the road is remembered at all today, it is for the incident that took place 140 years ago this week - the fabled Frog War. But the Mercer and Somerset should mean much more to residents of our town because this is the railroad that put Hillsborough on the map. 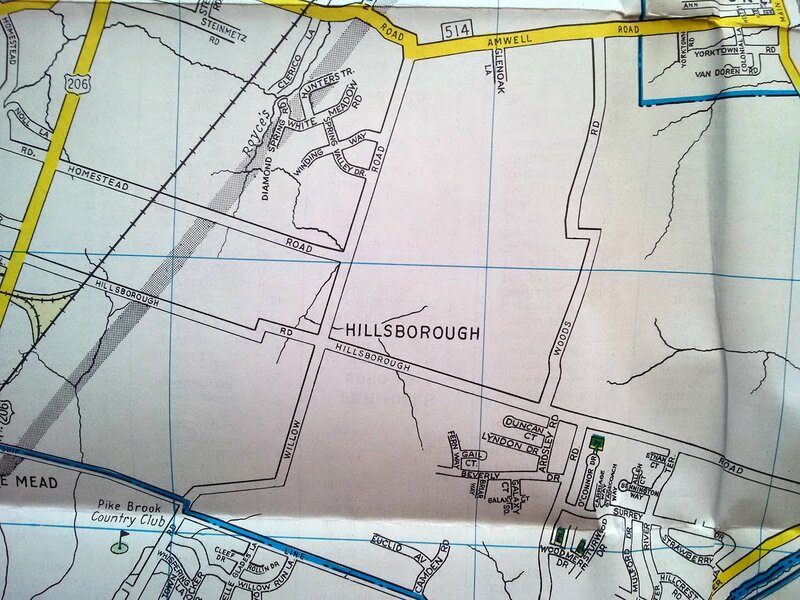 placing "Hillsborough" at the crossroads of Hillsborough and Willow Roads. When people use that phrase, it is usually meant figuratively, but I mean it literally. 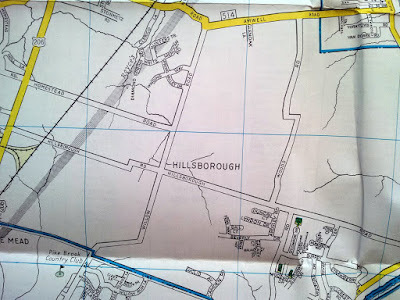 It's why most maps from the 1870s onward if they designate Hillsborough at all, place it at the crossroads of Hillsborough and Willow Roads - as if that is or ever was the center of "Hillsborough", or that there was ever a village of that name at that location. No and No. 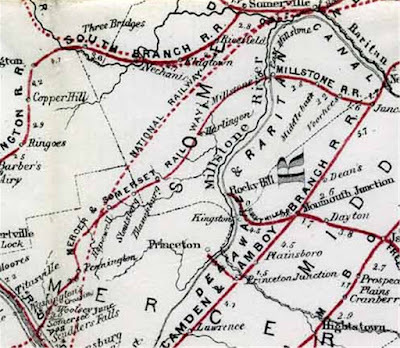 The Mercer and Somerset Railway Company was chartered in 1870 and was soon controlled and operated by the Pennsylvania Railroad. Work commenced on a rail line that was built for only one purpose - to block a potential Philadelphia to New York railroad proposed by the National Railway Company. 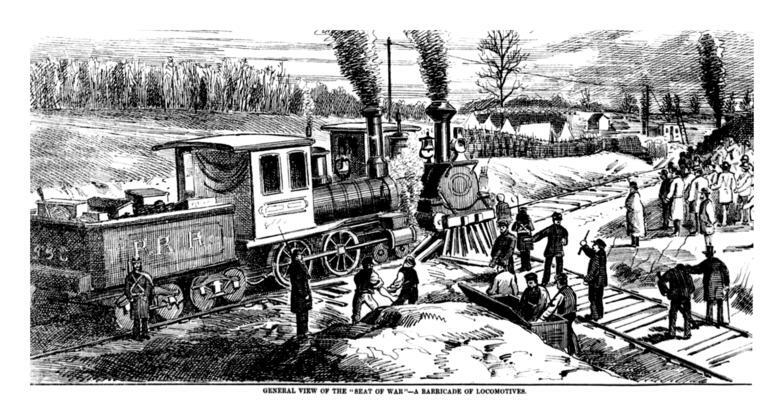 The first trains rolled over the completed line - from Millstone to Somerset Junction on the Delaware River north of Trenton - on February 6, 1874. Stations were located at West Millstone (Millstone), Hillsborough, Harlingen, Blawenburg, Stoutsburg, Hopewell, Marshall, Pennington, Woolsey, Burroughs, and Somerset Junction. 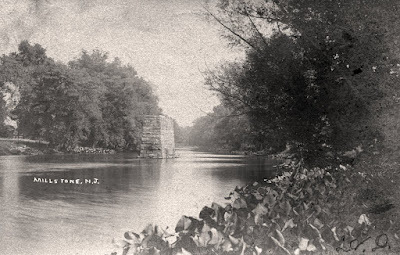 A connection across the Millstone River to the Millstone and New Brunswick Railroad provided connecting service through to New York - but that didn't deter the National Railway - operating as the Delaware and Bound Brook Railroad - from continuing to build. also the post office, general store, and blacksmith shop! 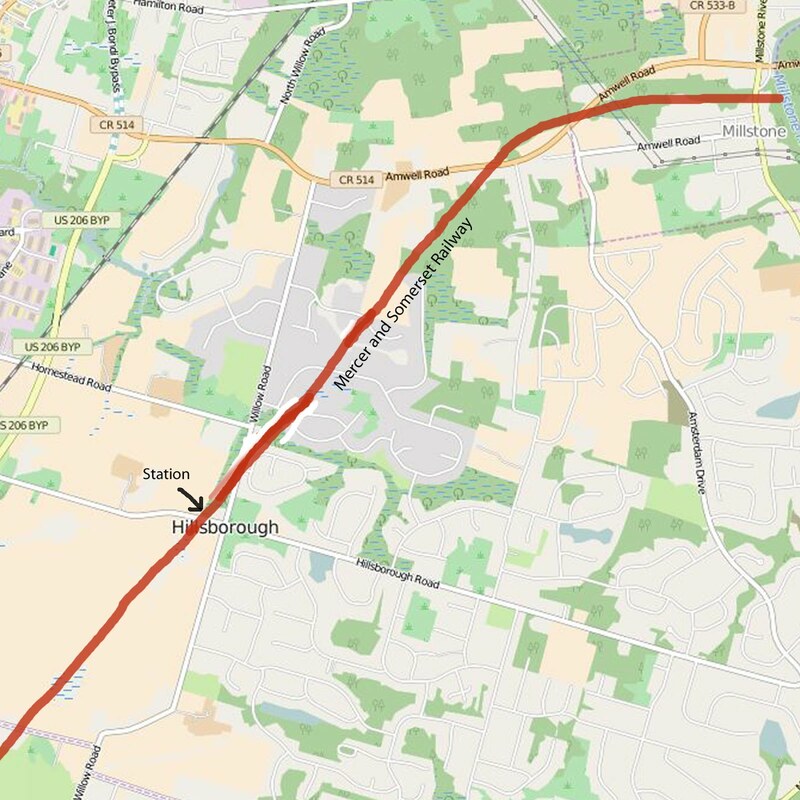 It was said that in order to secure the right of way through the farmland northwest of the intersection of Hillsborough and Willow Roads, the Mercer and Somerset agreed to build a station on the property. There was no obvious choice when it came to naming the station because the route did not pass through or near any village. According to author Henry Charlton Beck in his classic book of Jersey lore "Fare to Midlands", the first choice was Oleander. Odd since the poisonous plant is not native to New Jersey. It was finally decided to simply name the station for the township. Although hundreds of thousands of dollars were spent in building the railroad, there was only one profitable year, 1875. The profit amounted to about $600! 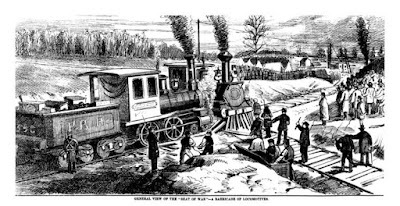 On January 6, 1876, the Delaware and Bound Brook Railroad - laying track south from Bound Brook and north from Trenton - reached Hopewell where they would need to lay a "frog" across the Mercer and Somerset track. The Pennsylvania Railroad had been anticipating this eventuality for some time, fighting in court and placing a heavy locomotive on their tracks at the exact spot the frog would need to be laid. 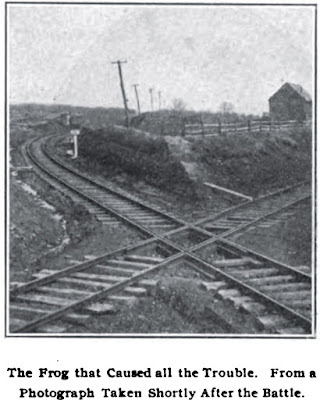 Each time a Mercer and Somerset train would approach the area, the Pennsylvania engine would be temporarily moved to a siding so the train could pass, then moved quickly back into position. The Delaware and Bound Brook officials had observed this behavior, and on the night of January, 5 moved 200 men into a nearby cornfield. The next day, as soon as the Pennsy loco went to the siding, the DBB men rushed the scene - chaining the engine to the tracks and blocking it with rails and ties. They quickly set the frog in place and brought one of their engines to the spot. The Mercer and Somerset countered by telegraphing to Millstone and ordering another locomotive down the line to ram the DBB train. By the next day, thousands were on the scene - railroad employees, spectators, reporters, and the New Jersey National Guard. An all-out war was narrowly avoided with the Delaware and Bound Brook formally given permission to cross the Mercer and Somerset. 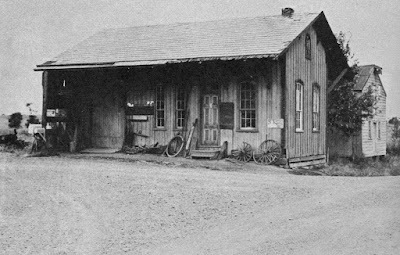 the station was near the intersection of Hillsborough and Willow Roads. That was basically the end for the Mercer and Somerset. The railroad limped along for three more years, never again turning a profit. The Pennsylvania Railroad bought the Mercer and Somerset outright at a bankruptcy foreclosure sale on November 28, 1879, and the train made its last run on January 21, 1880. The entire 24 miles of track was torn up within three days after the final run. Most sources declare that the right-of-way was immediately transferred back to the original property owners in Somerset and Mercer Counties. Research reveals this was not the case. 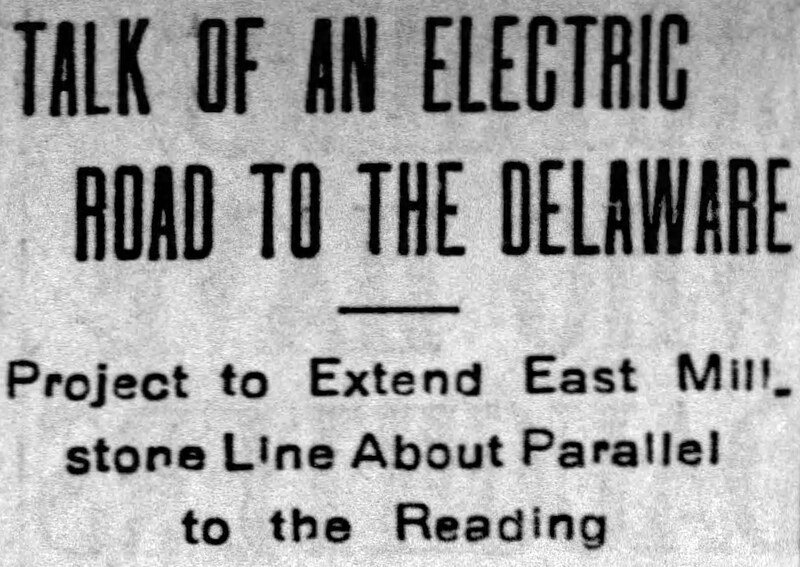 In 1909 the Pennsylvania Railroad contemplated switching their New Brunswick to East Millstone branch from steam to electric. Part of the plan included extending this electric railroad across the Millstone River to the Delaware River, utilizing the former right-of-way of the Mercer and Somerset which had been retained by the Pennsylvania Railroad. This would have been a light-rail line focusing on passenger traffic. Alas, it was not to be - but we can almost imagine a SECOND frog war as the construction crews once again neared Hopewell! 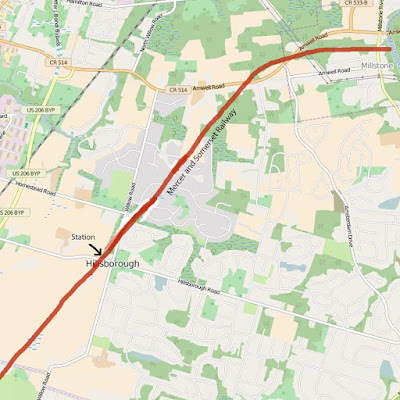 Today, the route of the Mercer and Somerset through Hillsborough Township is nearly completely obliterated. To draw the map shown above, I referenced a 1931 aerial view which still faintly showed the route. 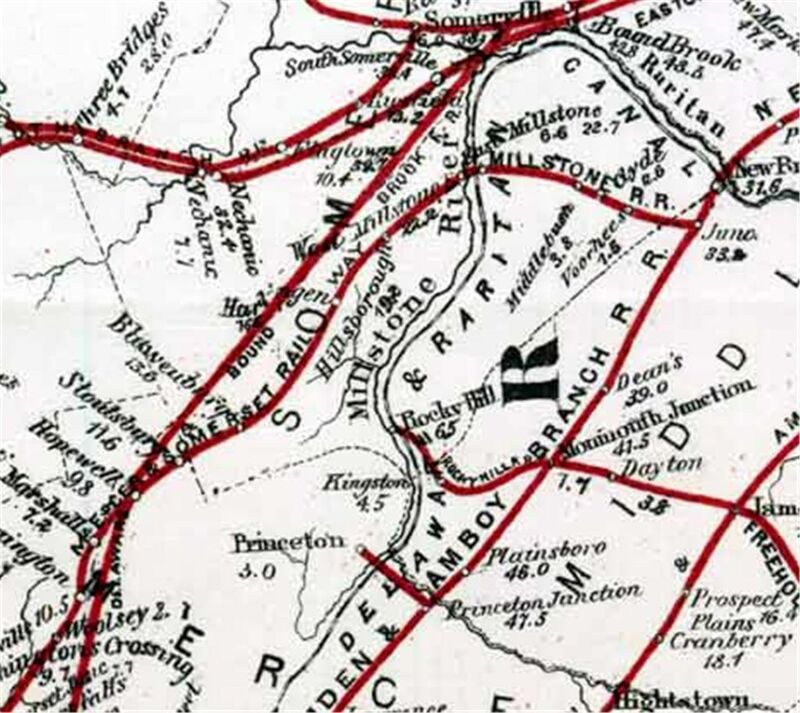 Even after the railroad was long gone, maps continued to print the word "Hillsborough" at the crossroads, just as they had when the trains were running. Mercer and Somerset Pennington Station. As of this writing, the building is still standing. The Hillsborough station remained standing for many years. It was already being used as a post office while the railroad was still operational, and later was in use as a general store, and a blacksmith shop. 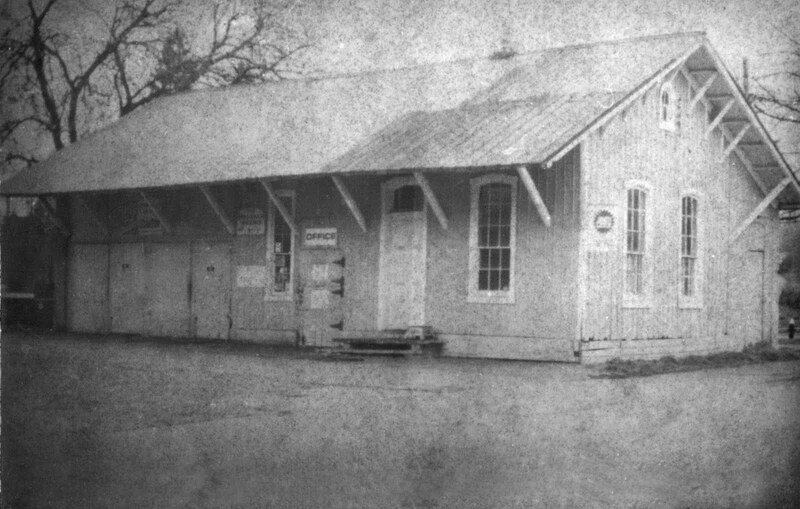 In recent times, some Hillsborough residents and the otherwise curious may have come to the mistaken notion that the Hillsborough and Willow Road intersection was once the location of the village of Hillsborough - after all, there was a train station, a post office, a general store, and a blacksmith shop! Not to mention that all of the maps put "Hillsborough" on that spot. Late 1870s Delaware and Bound Brook passenger ticket. Now you can tell them the truth about the Hillsborough crossroads - and the railroad that put "Hillsborough" on the map. Very interesting to learn a bit about our town's history. Thank you! This is a very good depiction -- perhaps the best -- of the great frog war of 1876. Thanks for the kind words. 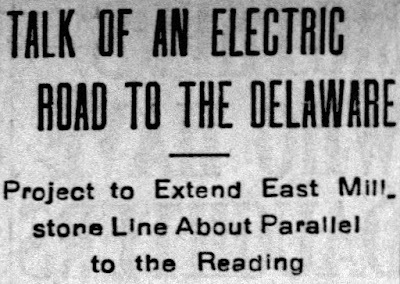 In fact, your comment today motivated me to finally rewrite a section near the end of the article to include new information about the date of the final run, and th proposed 1909 electric road.